Giresun, which is located in Eastern Black Sea Region shares borders with Ordu, Sivas, Erzincan, Trabzon and Gumushane. Giresun, which is known as one of the pearls of the Black Sea, will provide you with all its generosity. If you are one of those who want breathe the air of this perfect city, you can check flight tickets to Giresun without losing any time. In the city, which is thought to have been built in the 7th century B.C, settlements go back further. The fact that Turks have moved to this land in 20th century B.C is a proof that the city is a historical one. In these lands, which have been home to many great countries like The Persian Kingdom, The Roman Empire, The Pontus Empire and The Ottoman Empire, not only history but also nature is waiting to meet you. You'll have a short journey with cheap flight tickets to Giresun that you've bought from Pegasus. And the destination of this journey will be Ordu-Giresun Airport, which has opened to service in May 2015 and is the first airport to be built on sea not only in Turkey but in Europe. It's possible to reach the city center of Giresun by paid shuttle services from the airport which has been constructed between Gulyali district of Ordu and Piraziz district of Giresun. If you want to have a private car in Giresun, it's possible to rent a car from the offices at the airport. This fish restaurant that is located right at the foot of St. Jean Castle will amaze you with is view that brings blue and green together as well as serving a peerless meal. This restaurant where you can eat delicious fish and taste local delicacies is one of the must-visit spots of Giresun. This restaurant where you can enjoy both delicious "pides" and Giresun view will serve you an unforgettable Karadeniz pide. It's a must to enjoy a glass of tea facing the sea in this place which will allow you to start a beautiful day with traditional Giresun breakfast. In this cafe, of which design you'll love and which will help you satisfy your sweet craving in the most delicious way possible, you also have the chance to eat a meal. Many places have been waiting for you to shop in Giresun. You can buy small and sweet gifts from the souvenir shops in the city center or you can stop by Kazancilar Carsisi, which is a famous spot in the city, and shop there. The famous loin cloth or "pestemal" as it's called here is one of the things you can buy here. If you want to buy some foods and experience Giresun when you go back home too, nuts or nut products and cherries are among what you need to buy. You have many accommodation alternatives in Giresun where nature is quite generous about showing off its beauty. You can either accommodate in luxurious hotels in the city or wake up to days that are high in oxygen in a mountain house. This hotel, of which top floor has a pool that makes the sea view even better, is one of the most preferred alternatives of the city. Serving traditional tastes in the best way, Hotel New Jasmin also offers a shuttle service to the airport. This Giresun hotel, which will steal your heart with its cute design, will also become one of your favorites with its service. While the hotel serves you with the comfort of your home, its view that belongs to heaven will be a detail to make you have the perfect holiday. Damcilar Hotel, which is in the center of Giresun, provides good location, good service and spacious rooms for a good price. It's possible to wake up to the green nature and mountain view of Giresun in the hotel that is located in a huge mansion. The nostalgic design of Zifin Hotel adds a different atmosphere to the view. It's possible to have a holiday which touches nature and allows you to enjoy natural beauties in Giresun, which has been a settlement area for centuries. Giresun's attractions promise enjoyable days. The first thing on the list of must-do is climbing a plateau. This castle which has been built by the Empire of Trebizond will lay the view of Giresun before your feet. Watching sunsent from the castle will bring you peace. This castler where you can watch the green-filled view of the city will help you touch both history and nature. 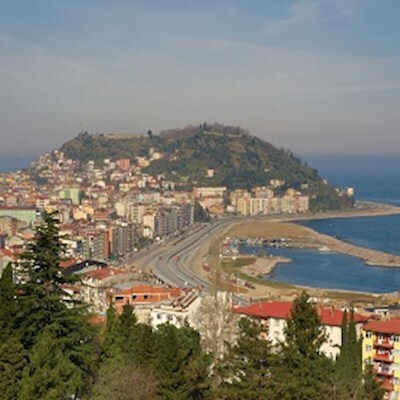 This museum, where archeological findings are exhibited, may help you get a satisfying load of information about the history of Giresun. Moreover, the fact that the museum is located in an old church will take you to an interesting ambience. Giresun Islan, which proves that Black Sea is a part of heaven, will provide you with the meeting and the great love of green and blue. Being one of the peaceful spots of Giresun, Kuzalan Waterfall impress you greatly. Nightlife is not that lively in Giresun but there are some cafes and bars where you can have a good time with your friends by listening to live Black Sea music on the shoreline of the city center.